But sometimes, especially with new braces or braces that have just been adjusted, the last thing on your child’s mind is breakfast. Fortunately, Dr. Hurd can recommend many early morning options that will be both gentle on braces and healthy for growing bodies! It’s described as the most important meal of the day for many good reasons. With some of these easy-to-prepare breakfasts, you can add delicious, healthy, and braces-friendly to that description! If you stumble on a delicious recipe, don’t forget to share it the next time you visit our Burlington, ON office! If your pre-teen or teenager is home for the summer, it’s easy to provide braces-friendly lunch options. The school lunchroom, though, presents another challenge altogether. What menu selections are most compatible with braces? And what can you put in that lunch box or brown bag to provide a tempting, healthy lunch during school hours? Let’s look at some options! There are many great options for packing a lunch bag! Just remember to keep foods at the proper temperature, with insulated containers for hot foods and two cold sources, such as two frozen gel packs, for cold foods. Sandwiches with soft filling (no chunky peanut butter!) on soft bread. Thinly sliced, easy to chew cold cuts will work, but cold cuts like salami are too chewy. Cut the crusts off if necessary. Cutting sandwich wedges into smaller portions will also make them easier to eat. And remember to send your child to school with a brush and floss to clean teeth and braces after lunch. Dental hygiene is very important now, because brackets and wires can both trap food particles and make brushing them away more difficult. This can lead to increased plaque, cavities, and staining around the area of the braces. If it’s impossible to brush, be sure to remind your student to rinse thoroughly with water after eating. Lunch hour should be a time to relax, get together with friends, and recharge for the rest of the school day. Talk to us about the most (and least) braces-friendly foods and recipes. By learning what foods to avoid and adjusting some old favorites, your school-age child can continue to enjoy healthy, tasty lunches. Most important, visiting Dr. Hurd at our Burlington, ON office for an emergency repair will not be on anyone’s list of afterschool activities! 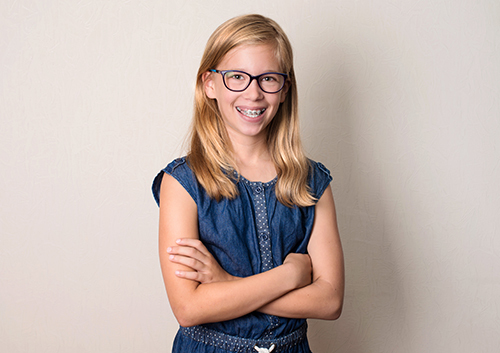 You might be surprised to learn that Dr. Hurd and our team recommend an orthodontic appointment even before your child has had that last visit from the Tooth Fairy. In fact, orthodontic assessments at our Burlington, ON office can be beneficial at many stages of your child’s life. Let’s look at some of the reasons why. There’s a reason why we recommend that every child see an orthodontist by the age of seven. If there’s room enough in your child’s mouth to accommodate all the permanent teeth that will be arriving soon, you’re good to go. But if it looks like there won’t be enough space for those adult teeth, there are solutions we can offer to make the transition from baby teeth to adult teeth a smoother one. If your child’s mouth is small, the permanent teeth might have too little room to fit in when they arrive. We may recommend gently enlarging the upper dental arch with the use of a palatal expander. This device will provide room for the adult teeth, and could potentially shorten second phase treatment time. Too much space can also be a problem. If a child loses a baby tooth too soon, too much space between the remaining teeth can cause them to shift out of position, leaving the wrong spot open for the adult tooth to come in. We might recommend a space maintainer so that there is no shifting of the teeth, and there is room for the adult tooth to erupt in its proper spot. If there is a bite problem, early treatment can prevent more serious problems down the road. If no treatment is necessary immediately, we can monitor the development of your child’s teeth and bite during periodic visits. Once your child has achieved that perfect smile, it’s time to maintain it. Teeth actually move and shift throughout our lives, whether we have had orthodontic treatment or not. But with orthodontic treatment, the bone tissue and ligaments around the teeth remodel over time to hold the teeth in their new and improved positions. That’s why it’s often important to wear a retainer constantly for several months after the braces come off, as bone and ligament become a firm, strong anchor for the newly aligned teeth and bite. But there’s no one expiration date on retainers! Worn nightly as needed, they help teeth stay securely in their new positions for a lifetime of beautiful smiles. 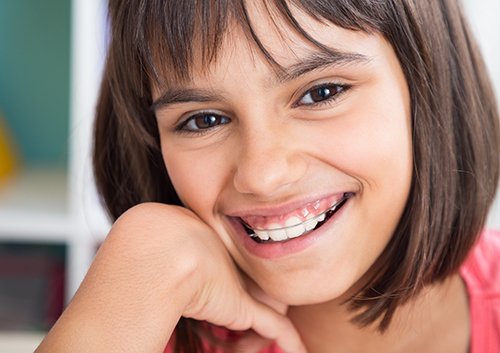 If you think your child is ready for any phase of orthodontic work, give us a call. We will be happy to make sure there is ample room for permanent teeth to erupt in their proper spots even during the baby teeth years. If braces are indicated at a later date, we will analyze any potential alignment and bite problems and present all of your treatment options. 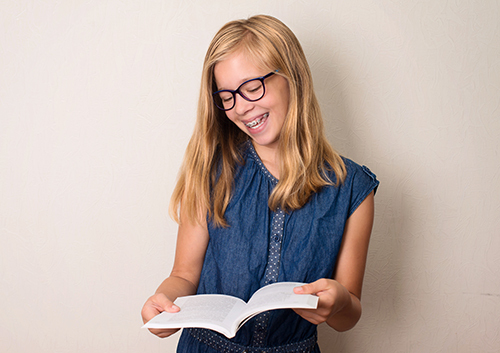 Finally, after the orthodontic work is completed, we want to make sure your child knows the best way to maintain that beautiful smile with conscientious retainer wear. If you have any concerns about your child’s teeth or bite, even before the permanent teeth arrive, give our Burlington, ON office a call. Early treatment can often prevent future problems and might even lead to faster orthodontic results. At each stage of your child’s growth, we are here to provide your best options for healthy, happy smiles. In the long run, wearing braces is so worth it. Whether you’re working toward straight teeth, an improved bite, or both, you’ll end up with a beautiful smile! But sometimes, in the short run, they can be really annoying. Braces can irritate your lips, tongue, and cheeks while you are getting used to them or after an adjustment. Or a problem wire can poke the inside of your mouth and you can’t see us immediately for a repair. At times like these, Dr. Hurd will recommend orthodontic wax to make your life more comfortable. Orthodontic wax is made from non-toxic products like beeswax, carnauba wax, and paraffin wax. Some products might contain extras like vitamin E, aloe, or flavorings. The soft wax covers the bracket or wire that is bothering you with a smooth surface that won’t irritate sensitive mouth tissue and will give sore areas a chance to heal. What if I Swallow a Piece? All dental wax is made of non-toxic ingredients. If you accidentally swallow a bit, no need to worry. Is It Hard to Apply? It’s not hard, but it takes a bit of practice. First, locate the wire or bracket that is causing the problem. You might know where it is right away, or be able to discover it by discovering which sharp bracket or wire is across from the sore spot in your mouth. Always wash your hands first. Brush and floss, so you will have a clean surface to apply the wax. The drier the surface, the better the wax will stick, so let the area air dry or use something clean such as sterile gauze to dry around the bracket. The wax is actually quite easy to work with. Break off a small piece of wax (no bigger than the size of a popcorn kernel or a pea), roll it in your fingers to soften it, and press the wax firmly but carefully over the problem bracket or wire until it sticks. Rub until the wax is smooth. Don’t worry, we will be happy to show you just how it’s done. Can I Eat with Wax in Place? If you find that you can eat without much irritation, it’s better to eat without wax over your braces. Remove the wax before eating and brush carefully to remove any food particles from your braces before applying new wax. If you do snack while using wax, be sure to change it after you eat. Wax, after all, sticks easily to your braces—and food particles stick to wax! Not a good look, and not good for your teeth. Take off any wax before you brush and floss. Your toothbrush will thank you! You probably have lots of other questions. Can you sleep with wax on your braces? Will it help you be more comfortable at trumpet practice? That’s why we’re here! If you have any questions at all about orthodontic wax and how to use it, call our Burlington, ON office. We want to make sure that the months you spend wearing braces are as comfortable as possible on your way to a lifetime of beautiful smiles. It’s so worth it!